The New Zealand dollar fell sharply by the end of the Wednesday’s trading session and remained weak at the start of the Thursday’s session. The reason for the huge slump was an extremely underwhelming employment report. The Statistics New Zealand reported that employment rose 0.1% in the December quarter of 2018 from the previous three months, missing the consensus forecast of a 0.3% increase. The unemployment rate shot up from 4.0% to 4.3%, above the average forecast of 4.1%. The labor cost index rose 0.5%, missing the median forecast of a 0.6% increase slightly. Released earlier on Wednesday, the Global Dairy Trade Price Index showed an increase by 6.7% from the previous reporting period. Dairy prices often have a big impact on the New Zealand currency as dairy products are an important source of New Zealand’s export revenue. 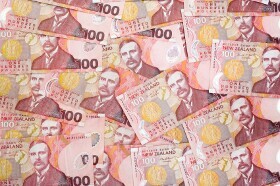 NZD/USD traded at 0.6767 as of 23:26 GMT today after tumbling from 0.6892 to 0.6773 earlier. EUR/NZD was at 1.6797 following the surge from 1.6541 to 1.6765. NZD/JPY tanked from 75.79 to 74.46 and extended its decline to 74.37 at the start of Thursday’s session.